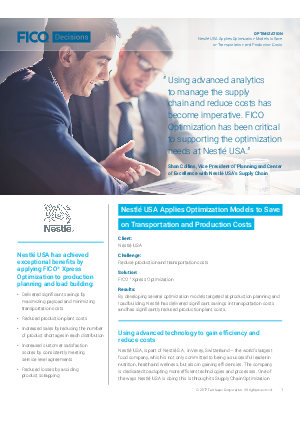 Nestlé USA turned to FICO® Xpress Optimization Suite, a key offering within FICO® Decision Management Suite, to calculate the very best shipment combinations from millions of possibilities – leading to significant transportation cost savings over the past seven years. They’ve also used Xpress to optimize redeployment of inventory from one distribution center to another – and even have developed an application to help their largest customers manage payloads. Download Nestlé USA’s story now, and learn more about how Xpress is helping them change their entire supply chain paradigm.